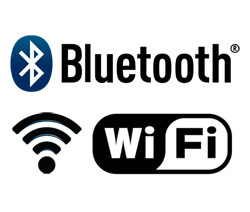 Bluetooth or WLAN - Which do I choose? One wireless technology cannot cater for all application requirements. 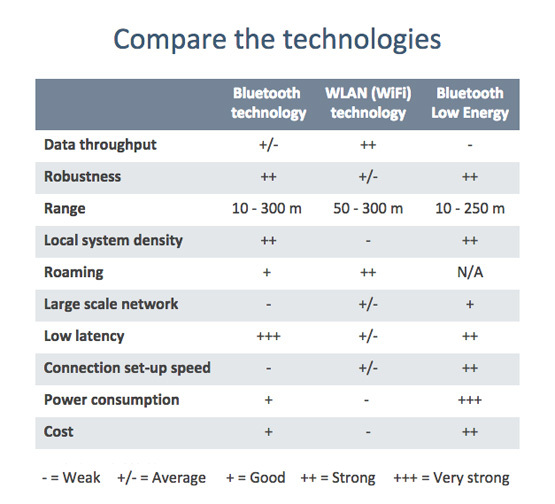 The standardised wireless technologies — WLAN, Classic Bluetooth and Bluetooth Low Energy — are good at different things. WLAN (also commonly referred to as WiFi) is the most widely used wireless standard. It is often used for production planning and data acquisition as well as applications where rapid roaming is required. It provides very high data throughput but it's long wavelength makes it vulnerable to disturbance. Bluetooth is often used for Human Machine Interfaces (HMI), programming, service/maintenance and real-time control tasks. It has a narrow band frequency spectrum which, together with functionality such as: Adaptive Frequency Hopping (AFH), makes it less sensitive to disturbances. During the last few years, other technologies like Bluetooth Low Energy technology have become increasingly used for sensors, actuators and other small, often battery-driven, devices that need to be interconnected. Please call our Technical Support Team on 01254 685900 if you have any questions about industrial networking and the range of products we supply. They will be happy to discuss the different options available and which technology is best for your specific requirements.